What are the top Rome tourist attractions? If this is your first time visiting, find out what monuments, fountains, churches and museums not to miss! Maybe this list seems obvious to some of you, but I know first-hand that many people have not heard of a lot of the monuments or sights that we would consider "must-see." Even I love to see all of these, and I live here. And believe me, I NEVER get tired of them. If this is your first time in Rome, don't miss these 10 Rome Tourist Attractions! Clicking each of the photos below will take you further down the page where you can read just a bit about why it's in the top ten Rome tourist attractions, and quick tips about visiting them. For more, you can also visit their dedicated pages. For all but one of these Rome tourist attractions, you can even visit without going inside (or queuing or paying). This means if you have a very short time in Rome, even just a day trip from your cruise ship, you can still see most if not all of the top 10 Rome tourist attractions in a single day. Do you have 2.5-3 days in Rome? Find out the best way to see all these sites, and more. For some more ideas of great Rome tourist attractions, skip down to here. And for a map of all these places, skip down to the bottom of the page. And the 10th? My suggestion to make your stay complete . . .
Capitoline Hill, Campidoglio, as designed by Michelangelo - is it any wonder this should be on your top 10 list of must-see Rome tourist attractions? Don't miss Capitoline Hill. Why? Find out here. This often means, they want to see the Sistine Chapel. But since you cannot just visit the Sistine Chapel (it's at the end of the enormous Vatican Museums), then you kind of need to make the Vatican one of your must-sees when visiting Rome. Getting to the Vatican is easy, even though it's not technically part of Rome and is across the Tiber river from the historic center of Rome. I strongly urge you not to plan any other major things to see or do on the day you visit the Vatican and Vatican Museums. It does not an entire day, but it will zap all your energy. But it is so worth it! For more details, visit my pages about . . .
A visit to Rome would not be complete without at least glimpsing the Colosseum. The Rome Colosseum is a must-see! You can go inside, or just visit it like this from the outside, but don't miss this stunning historic monument! But there is so much more to see in Ancient Rome than just the Roman Colosseum. There is the Ancient Roman Forum, the Palatine Hill, the Capitoline Hill and much more. This can take up your whole day if you have the time, or, you can just breeze by it all in an open-bus if you have very limited time in Rome. Don't miss my tips about visiting the Colosseum. Everything you need to know about Colosseum tickets is on my page here. For a special visit, try a night tour of the Colosseum. Looking for places to eat near the Colosseum? Visit my page about this here. Wondering why the Colosseum is full of holes? Don't my my top 10 Fascinating Facts about the Rome Colosseum! I am pretty sure the Trevi Fountain is one of the most famous fountains in the world. Or maybe it's THE most famous. We actually have many beautiful fountains in Rome, but this is the one everyone wants to see. The Trevi Fountain - one of the most well-known and beloved fountains in the world, and a must-see in Rome! And it's easy, since it's right in the center of Rome, and near lots of other stuff you probably want to see too, like the Spanish Steps and the Pantheon. And, don't forget to throw a coin in, to ensure you return to Rome! For more info about the Trevi Fountain, like who built it, what happens to all the money people throw in there, what is the building behind it, where to eat nearby, and much more, visit my Trevi Fountain page. Wondering what's the best way to see all these sites? Check out my page about how to see Rome in 3 Days, for the perfect itinerary. Yes the Trevi Fountain is famous and it certainly is one of the top Rome Tourist Attractions. But I am partial to this fountain and this piazza. Just look at it! You come upon it as if out of nowhere and just . . . wow! It has this effect on my every time. This piazza is also really easy to get to, as it's only a few minutes' walk from the Trevi Fountain and Pantheon. 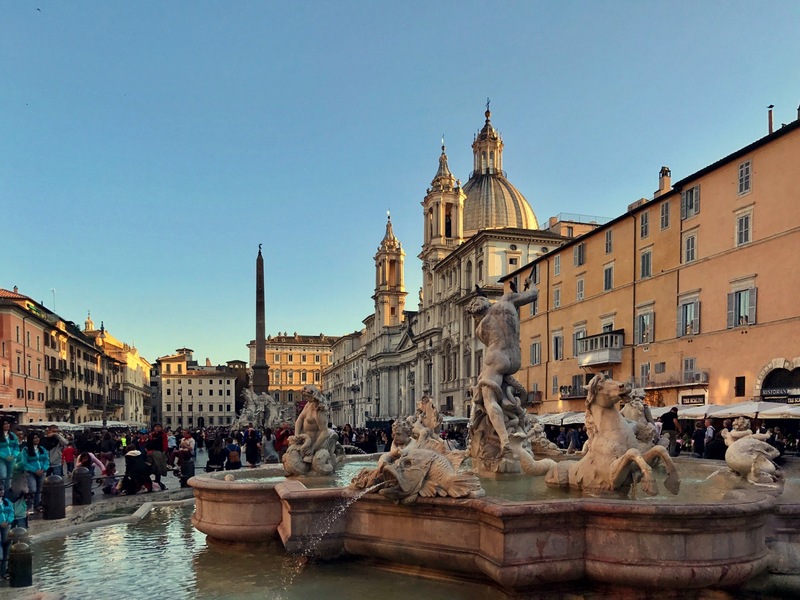 For more about this amazing place, who built it, and some fascinating ghost stories, visit my Piazza Navona page. The Pantheon in Rome knocks my socks off every time I see it, and I see it a lot. Don't miss this unique, stunning monument! The Rome pantheon (not to be confused with the Parthenon in Athens) is one of the great wonders of all time. It's the world's largest un-reinforced concrete dome. And it was built around 114 AD so that is a long time for such a structure to still be standing, and so intact at that! One reason for this is that in the 7th century it was turned into a church, so it's been in use since it was built. There are plans to charge a small entry fee (beginning sometime in 2018). As of 2019, the Pantheon will remain free for the foreseeable future. Visit my dedicated page about the Rome pantheon for more, and go here to find out where to eat nearby. Normally the Spanish Steps don't look like this. They are usually full of people! It's a magnet for tourists and everyone loves taking photos here. I personally like it like this. At 6:30am. The Spanish Steps in Rome - a beautiful monument, especially at dawn with nobody around! Do you want to know more about this must-see Rome tourist attraction? And, for lots of great places to eat, including gelato, start here. Want to know about shopping in this area, THE shopping area in Rome? Go here. The Galleria Borghese is one of the most exquisite museums in Rome. One of the things I love about it is the fact that you can visit every room of it in the 2-hour time slot you reserve. It's small enough that you can take your time and enjoy the art, but big enough that the 360 people visiting at a time are spread throughout the museum, so you don't have to feel crushed or crowded. Castel Sant'Angelo is one of Rome's most impressive monuments, and well worth a visit, inside and all the way up to the top! You can easily spot Castel Sant'Angelo as you near the Vatican. But it's also worth going inside, and up to the top, for some of the best views of Rome. But there's more to it than just views. Check out Emperor Hadrian's resting place, Renaissance Papal apartments, a rooftop cafe, and more. The Roman Forum - where the Ancient Romans enjoyed downtown city life. You can check out this view from Capitoline Hill (below), or, you can visit it as part of the same ticket as the Colosseum. I highly recommend a guided tour so you get all the history. And there is a lot! Michelangelo's design of the Piazza Campidoglio on Capitoline Hill is one of the reasons this is in my top 10 must-see attractions in Rome! Capitoline Hill is one of the famous "7 Hills of Rome", from when Rome was founded in 753 B.C.E. This is where there Romans built their temple to Jupiter (some of which is still visible, inside the Capitoline Museums). Michelangelo designed the square as you see it today. The equestrian statue in the middle is of Marcus Aurelius, one of Rome's "good emperors." This one's a copy. The original statue is inside the Capitoline Museums. Have you been here before? Do you have more than 2-3 days in Rome? Are you energetic and able to pack a lot of sightseeing into a short visit? You could spend the morning exploring the historic outdoor food market in Campo dei Fiori, and the nearby ruins (and cat sanctuary!) of Largo di Torre Argentina. You'll get to see where Julius Caesar was assassinated, and check out the hundreds of cats that roam these ancient temples. If you want to really get into the heart of Rome, you could spend the day wandering the fascinating neighborhood of Trastevere. The ancient Roman road - Appia Antica - is one of my favorite places to visit in Rome. Quiet, green, and full of ruins and history! What am I talking about? Well this is why I made this site. To help you get the most our of your short visit to Rome, based on what you want most to do in rome. What if you are here for the food (like me!) Ah, I have a whole list of restaurants and wine bars, not to mention gelaterie, not to be missed. On this page, I've listed what I think are the top 10 Rome Tourist Attractions, plus lots of other ideas that I think are the most fun and interesting. For a complete list of Rome sites, visit the page of the Rome Tourist Board.